It's Friday!!! 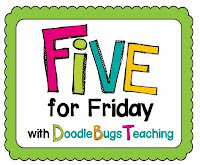 Time to link up with Amanda and Kacey for Five for Friday to share some things about my week. 1. In light of recent events, Jessica from Ideas by Jivey, Amanda & Stacia from Collaboration Cuties and I are getting together to host an uplifting linky! This Peace, Hope, Love, and Kindness linky party will be a place for you to link up whenever you have heartwarming stories, lessons you've done with your class about peace, hope, love, or kindness, or even random acts of kindness. When the world seems to be falling apart around us, we will have a webpage to visit to get a pick-me-up! We hope this linky will not only lift our spirits and remind us that there is so much good around us, but also will be an encouragement to us to be the good we want to see in the world. As teachers, we have such a powerful role in shaping the future...let's share our ideas so we can make the world a better place TOGETHER! So here's our idea- how awesome would it be for us to flood all the bloggy newsfeeds with uplifting posts? Let's all try to post for Peace, Hope, Love, and Kindness this Thursday! Then, you can come back anytime after that and link up as often as you'd like. Need some ideas? You know that awesome teacher friend that you wish you could show a little more appreciation...? Surprise them with Starbucks or breakfast one morning! Or maybe you have a child in your class who went out of their way to make someone else feel special...... share that heartwarming story with us! We're teachers- you know we eat it up! :o) Or perhaps you've done a lesson (or are going to do a lesson) that helps students find peace, hope, or love... or maybe a character-building activity about kindness. The options are limitless, really! We hope you'll join us this Thursday! Come back to any one of our blogs to link up! 2. Have you seen this video? It will give you goosebumps and warm your heart! The entire arena at the Boston Bruins game singing the National Anthem. 3. I got a class set of McDonald's cheeseburgers donated today! (Doesn't that sound funny? A class set??!!) I just finished teaching division and wanted to treat them with this juicy treat! D.M.S.C.B. (Does McDonald's Sell Cheeseburgers? and Divide, Multiply, Subtract, Check, Bring down.) 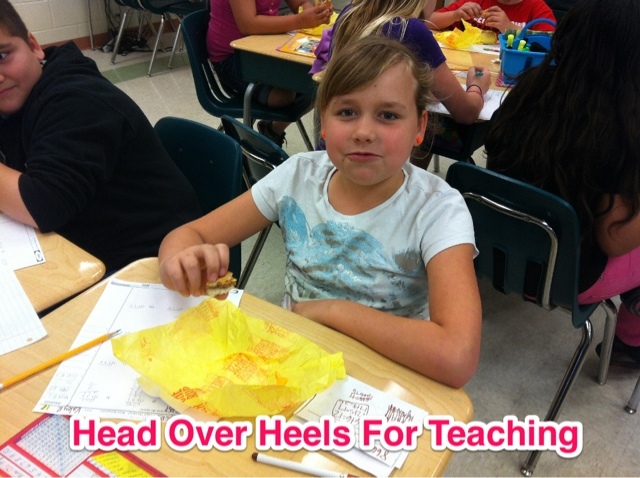 While they were at lunch I got into ninja mode and snuck to McDonald's and had a beautifully wrapped cheeseburger on every students' desk when they returned! They thought it was the greatest! 4. Do you know this movie? After testing each day I gave my students a little brain break. I couldn't take them outside for recess because my eye was irritated and the sun felt like it was burning a hole in it! So, I decided to show Homeward Bound-it's G (very rare these days!) and none of my kids had ever seen it! It was a huge hit! Tons of sarcasm and figurative language! Just thought I'd share! 5. Did I mention testing is OVER??!! So glad and SO PROUD of my students! I've never had an ENTIRE class go back and quadruple check their answers and actually reread the passages! I hope their scores reflect their hard work! Love them! 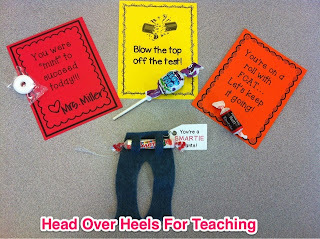 Below is a picture of the motivational cards and treats I gave them each day. If you want a copy of the notecards, click here. Check out what everyone else did this week!! Hope to see you back tomorrow for my Spark Student Motivation Saturdays! 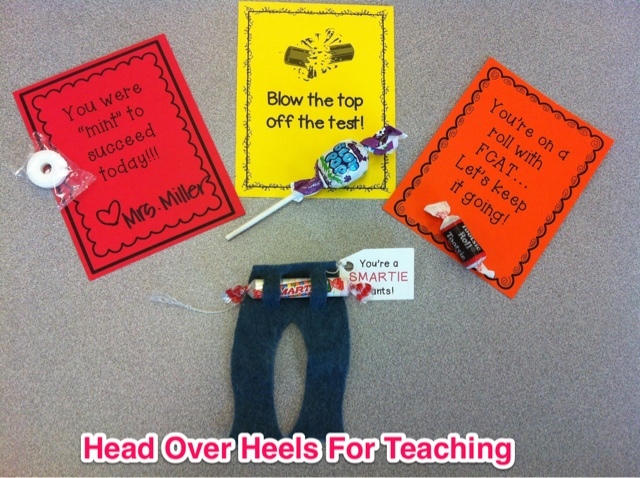 Link up one idea to motivate or encourage students! (Behavior, Reading Counts, academics, organization, ANYTHING you do to get students excited! That is so funny that they all got cheeseburgers!! I'm lovin' it! LOL that would never fly in my school, we are only allowed to give healthy treats and it cannot be instead of lunch and must replace any snack they brought themselves. Too many rules! I saw that Boston Bruins video on the news this morning. Thanks for hosting the linky party. It is a sweet idea. OMG! That is great! Love the cheeseburgers! I use that phrase for my students! Bummer...I'm teaching only language arts next year! How did you manage getting cheeseburgers donated? That sounds awesome!